In our old forums this was a popular topic. I have brought over the posts I feel may be helpful to those searching for information. This includes how to reconstitute vials and how to figure out the correct amount of solution to draw up so you take the correct dose. Unless otherwise noted all answers to the questions were provided by me. Question: Hi can anybody help me? I have a few 12 mg (36 iu) vials of Humatrope Somatropin and can only fit 1.5 ml of dilute into the vial of powder. How do I calculate and measure an iu from this? I am going to use a 1 ml insulin syringe too so looking at the 100 units marked on the syringe what measurement would I need for 4 ius? If anyone can help me out that would be great. Answer: First, I want to say that anyone taking HGH injections should only get them from their doctor and they should receive proper training on how to reconstitute and administer. Since I know not everyone goes to their doctor I will give this information because I don't want anyone trying to figure dosages without knowing how to do it. If you have no access to a doctor and you decide to use this information you do so at your own risk. I am an RN and I do not agree with anyone treating themselves with prescription drugs. Humatrope 12 mg is usually provided in cartridges however outside the U.S. I have seen 12 mg vials. Since I don't have the vial I can only give you directions based on the information you gave. You said you are using 1.5 ml of diluent so once you add the 1.5 ml of normal saline or sterile water into the vial of HGH the instructions should tell you how many mg per ml you will have. Based only on the information you gave me it looks like the vial will contain a total 12 mg or 36 IU per 1.5 ml of liquid (the entire bottle). On the U100 insulin syringe you would draw up to the 17th small line. This is 3 small lines under 0.2 so it is not much. Again, please consult your doctor and follow his/her advice. How Many IU's of HGH Should I Take? Question: I just read your answer to the young person wanting to take HGH injections and was wanting to know how much to take. I too am interested in the same information. I will be taking it with or with out your help, so, would much appreciate any informed information on proper doses to take and how often to take them. At this point I was going to take .2 cc once a day but not sure if this is enough to have the optimum affect. 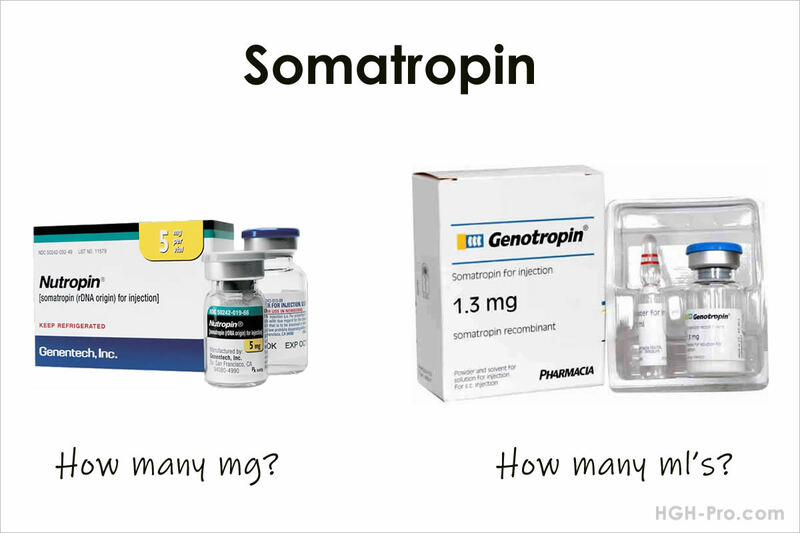 Answer: I am always happy to help when I can, but there is no dose of HGH injection (somatropin) that is correct for everyone based on age or weight. Every person's dose should be individually prescribed by a qualified physician based on their health history, physical, and IGF-1 and other lab results. Also, if I told you a specific dose of growth hormone injection that I thought you should take I would be practicing outside the scope of registered nursing. Even if I were a physician, I could not legally recommend a specific dose in this situation. You said that you were considering taking 0.2 cc once a day. Because there are different brands and vials that contain different amounts of HGH, in order for me to know how much you are considering taking I need to know the concentration. I need to know how many IU's or mgs of growth hormone are in 0.2 cc of your solution. If you have a vial that needs to be reconstituted, I would need to know the total amount of HGH in the entire vial, and I need to know the amount of bacteriostatic water that the vial is to be reconstituted with. Then I can figure out how many IU or mg of HGH per cc your vial contains. Generally, it is recommended to start with a low dose. Some doctors begin their patients with 0.5 IU per day, and then their dose is slowly increased in monthly increments of 0.5 IU as needed. The increase depends on blood studies of IGF-1 levels, and how the patient is doing. It is generally believed that doses of over 2 IU per day can cause side effects. I feel I should also mention, in case you were not aware, that the FDA has been investigating HGH injections being sold and used for reasons other than diagnosed deficiency and they are cracking down on people selling injections online, and also those buying the injections online. This is probably not what you wanted to hear from me, however, I feel obligated to mention this. Follow-up question: Thank you so much for your help and information. I truly understand exactly what you have told me and quite frankly expected that answer. I have looked for what I think are legit sites for doctor information for help with proper prescriptions, etc, with not much luck. Maybe I just don't know where to look. I wanted to go through the proper channels. There is only one doctor in this area over 200 miles away, that I know of, that is doing the HGH injections but the distance and cost is too cost prohibitive. There are no other doctors close that will talk to you about it. I thank you for your candid information and I will certainly keep it all in mind. I will try to be as cautious as I can and to continue to seek out the proper information for what I am doing. I believe in the HGH therapies and wish at this time to proceed with it. I do want to take the least amount possible and do not want to cause any harm or ill effects to my body in any way. Once again, I thank you for your remarks and information. Question: I'm a 55 yr old male, 6 ft and 180 lbs, I work out 5 days a week. I'm taking hgh for anti aging . I'm taking Norditropin FlexPro 15 mg pen. After taking Norditropin (1.2 mg in the morning) for a month I had my levels tested. They tested at 11.6 ng/ml, which is high. Research shows it should be at or below 3.0 ng/ml so I switched to 0.4 cc in the morning and 0.4 mg prior to bed, total 0.8 a week. A pen last me 19 days, at 5 days a week, thats about a month. I have not had my levels tested yet, but wondering if anybody has any insight to amount to be taking. Is it ok to take morning and night. What should my levels be at? I have now been taking for 2 months and I do notice a difference. Still have 10 pounds to lose.......more into cardio than lifting. Answer: You said you were taking 1.2 mg in the morning, and later you said that you switched to 0.4 cc in the morning and 0.4 mg prior to bed, for a total of 0.8 a week. I am confused because you are switching from cc to mg and they are not interchangeable as the same amount. For instance, 0.4 cc of liquid in the pen contains 4 mg of HGH, not 0.4 mg, and 0.4 cc of liquid contains 0.04 mg of HGH. If you were taking 1.2 mg of HGH, that is 0.12 cc of liquid. Anyway, from the information you provided I believe you are saying that your doctor did a human growth hormone stimulation test after you took Norditropin for 30 days on your own and your level was elevated above normal. I wonder what your level was before you began the therapy? It would be helpful to see the difference. Because HGH is only in the bloodstream for a couple of minutes before it is taken in by the liver it is very hard to obtain an accurate reading of the amount of human growth hormone in the body. The amount changes from the time it is released or injected until a few minutes later when it is taken into the liver. Even with a stimulation test there are unknown variables, and if you are taking the injections then the time you took your last dose may also affect the lab result. Because we cannot measure growth hormone very accurately most anti-aging doctors check the blood IGF-1 level instead of an HGH level. The reason is because once HGH is taken in by the liver its response is to release IGF-1 into the bloodstream. IGF-1 is stable in the blood longer and is a direct reflection on the status of growth hormone in the body. If your doctor did not check your IGF-1 level that would be my recommendation. The doctor can use this test result in deciding what is the best dose for you. You asked me about taking the Norditropin twice a day. Of course your doctor will prescribe your dose as he wants and I recommend you follow his instructions. However, you might want to ask him about dividing your dose into a morning dose and evening dose because it is easier on the body. In fact many doctors now prescribe the daily dose to be divided into 2 dose times, which are morning and bedtime. One reason dividing the dose into 2 dose times is better is because it is not natural for the body to have to deal with its entire day's worth of HGH all at one time. I believe this is one reason why side effects may occur. The pituitary gland naturally releases growth hormone in small spurts several times throughout the day as is needed. By following the body's natural occurrences as much as possible we can decrease the risk of side effects and probably see better results. What is the Recommended Dose of HGH Injections? Purity > 99% for injection. I am 25 and playing sports looking to gain and etc. what would be a good amount to take a day or week? 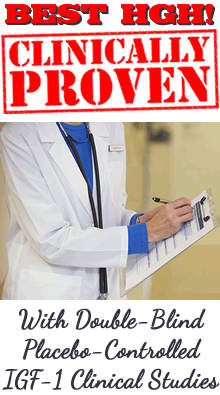 Answer: I cannot recommend any dose because only your doctor who has checked your HGH and IGF-1 levels should do that. You have probably already heard about the risks and dangers of taking the injections when your growth hormone release is not low so I won't go into that unless you request it, but I must say that as a medical professional safety is always my first concern. At your young age if you have no growth hormone deficiency then in my opinion there is no safe dose of HGH injections. I Received Only a 10 IU Syringe! The vial of HGH is 4 I.U. but the syringes are begin from 10 I.U. !!! How that?? My friend use HGH once per week, can i do that too? Answer: I am sorry but I cannot recommend a dosage of HGH injections for you to take. I do not agree with self administration because it can be dangerous, especially for young people who have no need for HGH injections. I know this is not what you would like to hear but as an nurse my first concern is the safety of those who take any type of HGH therapy. I don't know where you obtained the vial but hopefully those who sold it to you have access to a qualified physician who can prescribe the appropriate dosage for you. Regarding drawing up your dose out of the vial, they should instruct you on the proper way to reconstitute and draw up the correct dose. In another thread I explain about the insulin syringes that are usually used for the injection, they hold 1 ml of liquid total. I don't know about your syringe that begins with 10 IU. First, I need to know the total ml or cc of liquid that your full syringe will hold. The injections are usually given using 1 ml syringes. I do wish you the best and I hope that you are very careful and do not inject yourself if you are not sure about the dose or the way the vial was reconstituted because if the vial is reconstituted incorrectly it will affect the strength of the dose, which could cause you harm. I am sorry that I cannot help you more, but as a nurse I cannot recommend dosages of prescription medications, only your doctor should do that. Question: I am about to do a 6 month cycle of HGH and thinking of doing test and Dbol with it. With the HGH I'm going to do the first month at 2IUs then go to 4IUs for the rest of it. All 5 on 2 off. I am 5'6 and weigh 140. my body fat is 8%. I was wondering what kind of results i could expect? And what would be a good diet plan for trying to bulk with this cycle? Also I am 21 years old. Answer: I am sorry but I believe you are much too young to be taking HGH injections and testosterone. What you are planning to do for 6 months will shut down your body's own production of growth hormone and testosterone and you may even lose the pathway that prompts the release of these hormones when needed. Also, the gains received are usually not sustainable after you stop the therapy. I would expect you to see side effects at those doses and the testosterone will probably convert into estrogen. There are safer ways to optimize HGH and testosterone without the risks involved with HRT. Hormone replacement therapy is for those who cannot make enough of their own hormones any longer, not a young and healthy person who already has plenty. The body doesn't know what to do with all the extra hormones except to try to break them down and do away with them and that is why side effects occur. The link to our page that provides information about side effects is found in the left menu of this page, if you are interested. I know this is not the information you were hoping to receive but we do not support the use of any prescription hormones or drugs without a doctor's consent and management. I hope you will re-think your plans and decide that any short term benefits you might see are not worth the long term effects these drugs may cause you. PLEASE NOTE: The information I have provided is not meant to be medical advice. Please consult your private healthcare provider.